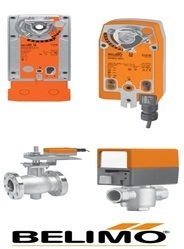 Prominent & Leading Manufacturer from Chennai, we offer belimo-actuators, valves & thermostats. actuators for a wide range of applications. True mechanical spring return, providing reliable fail-safe. Manual override crank eases installation (all EF, AF and NF series only). Low power consumption provides higher efficiency and smaller transformer sizing. performance due to temperature or supply voltage. Bronze, cast iron, and stainless steel ball valves with NPT and flanged connections. Range of fluid temperature ratings ideal for chilled and hot water, and steam. Fitted with damper type rotary actuators for easy field assembly and installation. RPTFE seats allows valve to operate in high temperature applications. Full, reduced, and standard ports and a wide range of sizes and Cv ratings for various applications. Actuator has a synchronous and a mechanical spring for fail-safe operation. Economical operation allows for low current draw and multiple valves per transformer. close-off and smooth, quiet operation with no water hammer. Looking for Actuators, Thermostats & Valves ?